Palmia Observatory: Autoguiding discussion with PHD2 software; Acceleration mechanisms for cosmic rays; Images of Mars and Jupiter; Ruby's question about wet concrete? Autoguiding discussion with PHD2 software; Acceleration mechanisms for cosmic rays; Images of Mars and Jupiter; Ruby's question about wet concrete? Well, this week we attended a discussion on autoguiding and also found time to get some fuzzy DSLR images of Mars and Jupiter and also discuss a little bit more about cosmic ray acceleration. But first we should describe one easy way to observe the effects of atmospheric refraction. In the previous post, I described my initial attempt, unsuccessful as it was, to measure the atmospheric refraction of astronomical objects as they are observed close to the horizon. It turns out that any amateur who has sufficiently good telescope alignment should be able to track an object across the sky and then see the position depart from the path, as calculated by its RA and Dec, as it comes closer to the horizon, the target should begin to appear higher in the sky than predicted. Yes, that seems a straightforward way of seeing the impact of refraction. Next up, since I am just getting started with using autoguiding on my scope, it was very timely that the OCA Astroimaging SIG had a speaker discussing that very topic. 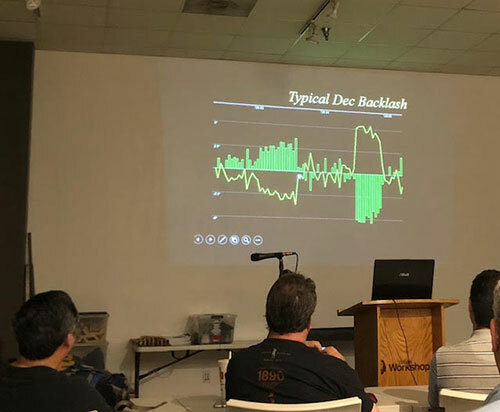 So, I met up with some other members of our Science Squad, Scott, John, and Larry, and attended the event where Bruce Waddington, one of the early developers of PHD2 autoguiding software, discussed the ins and outs of the software and issues with autoguiding. You can see in the photo below just one of the examples of problems that the autoguiding software is designed to if not solve at least mitigate. Just to make sure we are all up to the same starting point, remember that autoguiding means that a small telescope and camera, mounted on and aligned with the optical axis of the telescope, is used to track a visible target star and keep updating the motion of the telescope to ensure that that target star stays right there at the same position. If all of our telescope mounts were perfect, there would be little need for autoguiding, but because of errors in machining, and misalignment, and backlash in the gearing, and slewing at not exacting the same rate as the Earth rotates, etc., autoguiding is necessary if you want to do very deep astrophotography with very long exposures. My interest is not so much astrophotography, but in spectroscopic work you need to keep the spectrometer slit aligned perfecting on the star for long exposures. Anyway, it was a good discussion and we all enjoyed it. In the photo below, you can see how the mount drifts off the correct position and then needs much more correction, indicated by the dark green bars, to bring the scope back to the proper position. I remember from my early days studying control system engineering, we used a technique using describing functions to generate a gain curve to compensate for the nonlinear nature of backlash. It seemed to work in our homework, but I don't know what technique is used now, but compensating for backlash is still necessary. Several recent posts dealt with cosmic rays, which seem mostly to come to the Earth from every direction, not just the center of our galaxy, and not even from the galaxy itself. One of the things that is still being extensively studied is what are the astrophysical processes that can accelerate particles to the very high energies that we see in measurements now. So supernova remnants are still considered a leading source for the production of cosmic rays. I had been reluctant to mention some of the ideas here because I could see that it was going to be quite complicated. But I finally found the diagram below which helped me understand some of the basic acceleration processes. Without going into the details, such as how particles enter the region between two areas that they can bounce back and forth and gain a lot of energy, and of how they eventually get ejected out and then find their way to us and beyond. For now, without worrying too much about what kind of astronomical structure is being represented by the two train engines, just consider what could happen to the particle that is moving between them. If the collisions are all elastic, then as the ball hits each engine, the balls velocity increases according to how fast the engine is going and then returns to the other engine and keeps going back and forth and getting higher and higher energy during all of this bouncing back and forth. Now in reality, and this is where the details get really deep, the "engines" are considered to be gas clouds on each side of an expanding shock front associated with the supernova explosion. The particles can bounce back and forth over periods of millions of years, and gain a lot of energy, and eventually, somehow not described in the sections of the book I've got through so far, the particles escape and find their way to us. When the calculations of the amount of energy necessary to explain the energy and number of cosmic ray particles being generated it mostly fits with the best estimates of the number and distribution of supernova explosions. There seems to be much more work necessary, but it can mostly explain the cosmic ray energy spectrum, except for the very ultra high energy cosmic rays. If you are hungry for more of the details, you can check out the same textbook that I am using, which is referenced in the figure below. Ok, ok, so there is much more study necessary for understanding the acceleration of cosmic rays, but now is the time to go out and try to get some images of Mars, especially now that it is close as it is. Not wanting to carry out the scope, I did the next best thing and that set up the 600mm telephoto lens and just go outside with the camera and tripod. 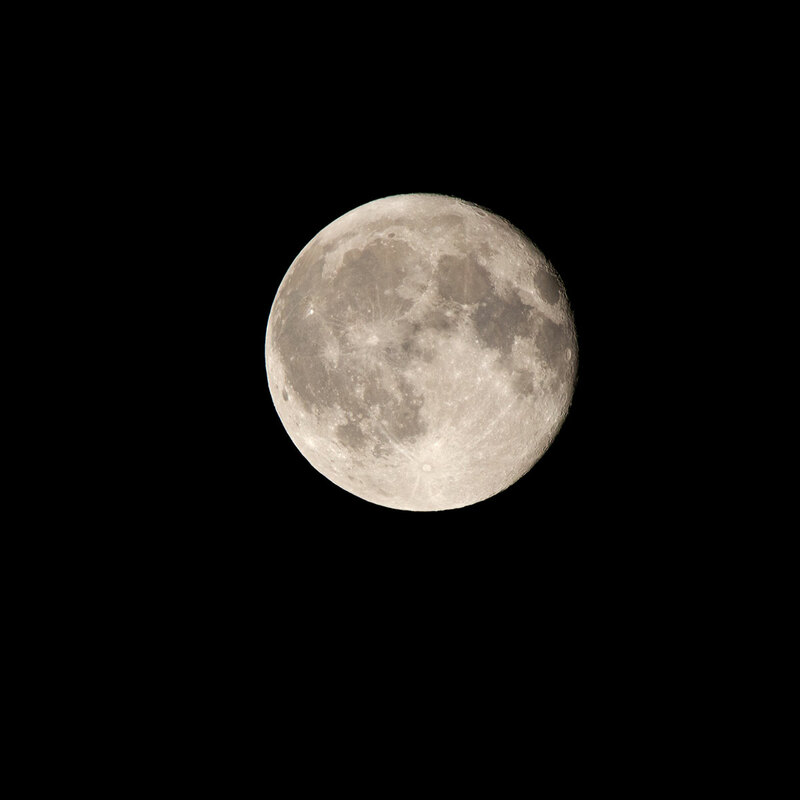 Earlier in the week, I shot the moon, which shows up in pretty good detail with a 600mm lens. Now, what about Mars? Well, it is pretty bright in the night sky, but 600mm focal length doesn't give you much definition. 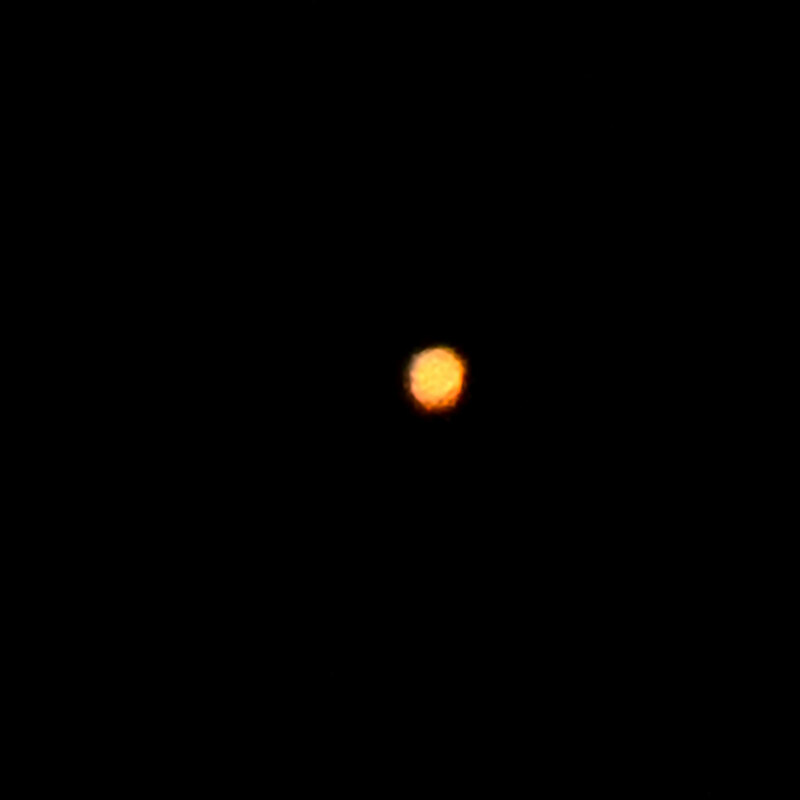 That is one drawback of just using the DSLR; I can't just through on a 2.5x Barlow and get more resolution. 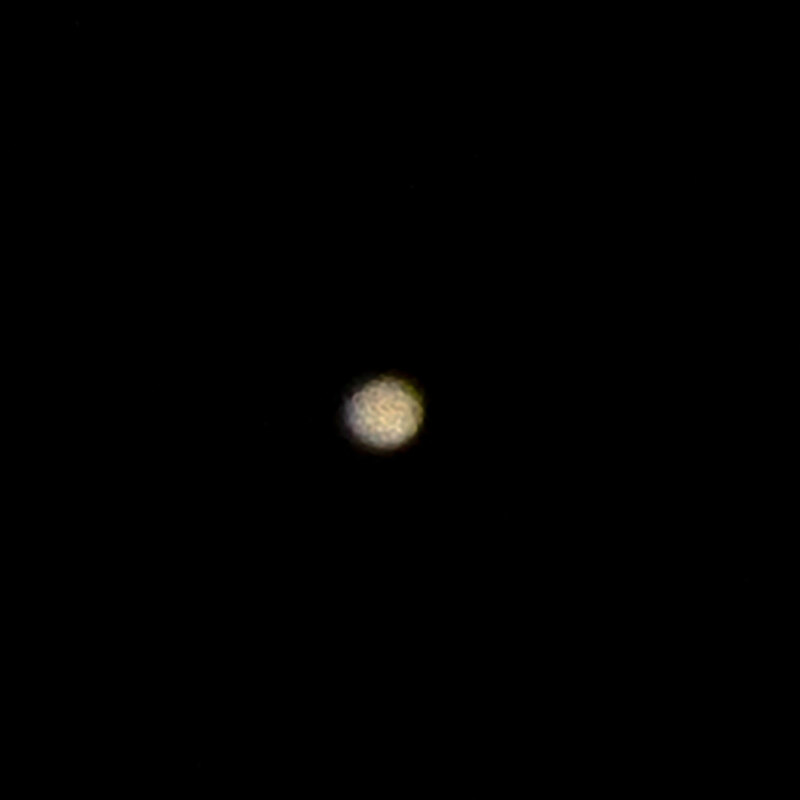 I also rediscovered that it is not all that easy to focus a telephoto lens on a stellar object under high magnification. Each time I touched the lens focus wheel, the whole tripod would rattle around and the image in the LiveView would shake and jitter and take about 3-4 seconds to settle down. So, I had to pretty much just live with the best focus I could find and you can see how well that turned out. 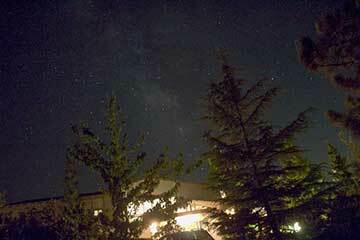 Jupiter was also up, as seen in the following image. Hmm, not much detail there either! I'm going to have to practice getting a better focus. I'm still not much interested in taking hundreds of images and doing all sorts of stacking and processing in order to remove the effects of seeing, so I guess this image quality is just about what I am going to get. I could just resolve to take out the scope, with 600-1200mm focal length, get a good alignment, use the better focuser, and put on the Barlow lens to get better images. That is what most astroimagers already do. 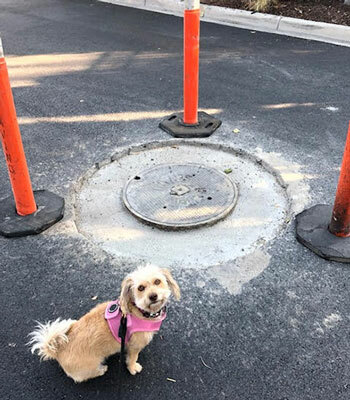 Finally, Astronomer Assistant Ruby asked is it just her or do other astronomers dream of putting their paws and fingers into wet concrete? I bet most of you have thought about this at same time or other. Well, to me, the answer is a definite yes! I have to admit that I was tempted myself, just yesterday, to do that, but by the time we returned to the construction area, the concrete had already set. Darn! Sorry, Ruby! Anyway, the good news is that we did not need to clean up Ruby's paws (nor my fingers).